YouTube is the number one social video sharing website in the world! Anyone can upload, view and share video clips all the time. A wide variety of video content is submitted to YouTube every day including movie clips, TV clips and music videos, as well as amateur content such as videoblogging and short original videos. Want to download and convert your favourite YouTube videos to iPod? - There is nothing easier! YouTube videos are streamed in FLV video format, that`s the main technology of online video sharing, because video streamed in FLV are in small sizes which can be easily shared with limited bandwidth. MelodyCan YouTube Ripper is a perfect YouTube video converter. It can download, save and convert any nice videos automatically , as well as converting youtube videos to any other formats . 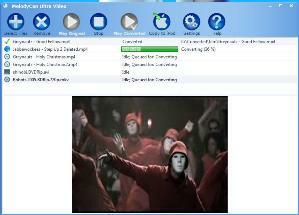 Such as Convert youtube to MP3, Convert youtube to iPod, Convert youtube to AVI, Convert youtube to MP4 etc. MelodyCan YouTube Ripper is a plug-in for Internet Explorer. MelodyCan supports MP4, AVI and MP3 as output formats for video conversion. You can select a desired output format and video size in MelodyCan settings by choosing a suitable encoder for video files. Just click on "Rip YouTube File" button on your Internet Explorer toolbar and the selected video will be saved to your PC in a desired format.